Okay, my to-do list is killing me but no one actually died of a list, right?. Death by to-do list sounds hmmm.. pretty off. 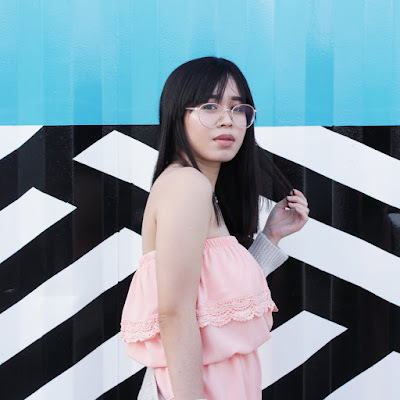 With a lot of things going on in my plate, the words earlier just popped in my head while I was about to take a me-time at the bathroom and thought it might be a good opening statement for this not so fancy blog-entry - review on product samples from Etude House & Max Factor. Haha. I don't care if you care or don't care.. I'm posting anyway. I'm happy to get at least one down off my to-do (blogging) list. I have here two sample packs of Etude House Pearl Aura Brightening Essence & Max Factor Whipped Creme Foundation each and Etude House Fresh Cherry Lip Tint in two variants. The product dispenses as a light liquid formula. A little goes a long way.. Spreading it all over the face is easy peasy, no mess. 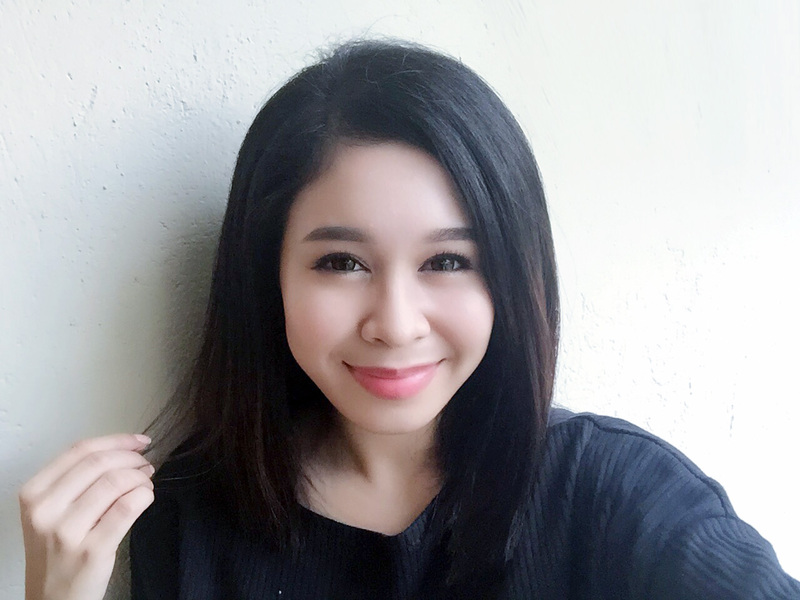 Tried applying and letting it set on the half of my face before I proceed on the other half to compare and see if the difference. When it comes to brightening, since my skin is quite on the fair department I didn't visible brightening results on my face. The area of my face with the essence looked somewhat glossier and a bit sticky when touched. Probably from it's moisturizing effect. Though I don't think it's the product for very oily skin (like mine). My face felt a bit more buttery when I woke up in the morning. The essence might work better for people with dry/dull skin. 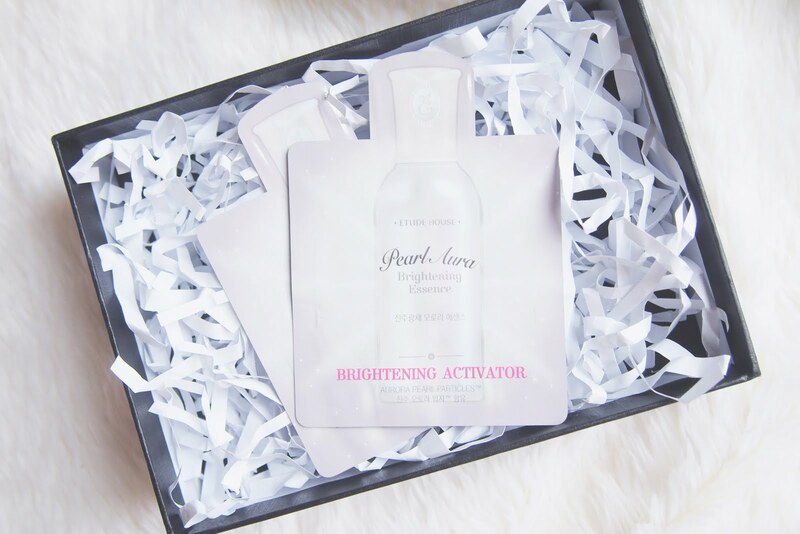 The Pearl Aura Brightening Essence is supposed to be used after first step in the morning and after cleansing in the evening. I only used it in the evening because my face might go oil crazy the whole day if I use it in the morning. I also think it's not meant to be used during summer when the heat just squeezes out all the sweat and oil from our face, might work a lot better during colder days. I've already emptied one trial pack (last for only 2-3 applications) and since I'm just using a trial version, which means less product the brightening effect might not be that visible. The actual 100ml bottle would probably give better results in the long run. Etude House Fresh Cherry Lip Tint promotes moist & shiny cherry lips with a creamy, smooth texture. Absolutely love it! I'm a real lip tint lover ever since. Haha. 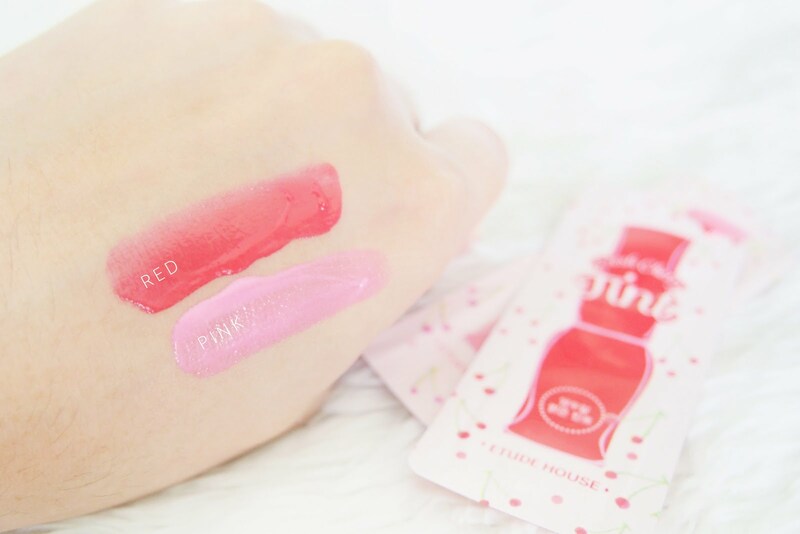 But what I love about Etude's Fresh Cherry Lip Tints is the colours of both pink & red tints. I do have the actual product in peach shade that I bought before I even got these samples. The tints did come in a creamy and smooth texture. The reason why I love tints is because they look natural, they actually last long plus they didn't dry my lips. Drink, eat, sleep.. It's still on! Haha. I did a swatch on my lips which I will be posting with the peach shade in a separate post soon. I was struggling to remove each lip tint on my lips for the shoot. I applied the red one last, note I applied the red tint at around 4 in the afternoon and though some areas of my lip lightened I still had parts of my lip tinted in the morning. Haha. 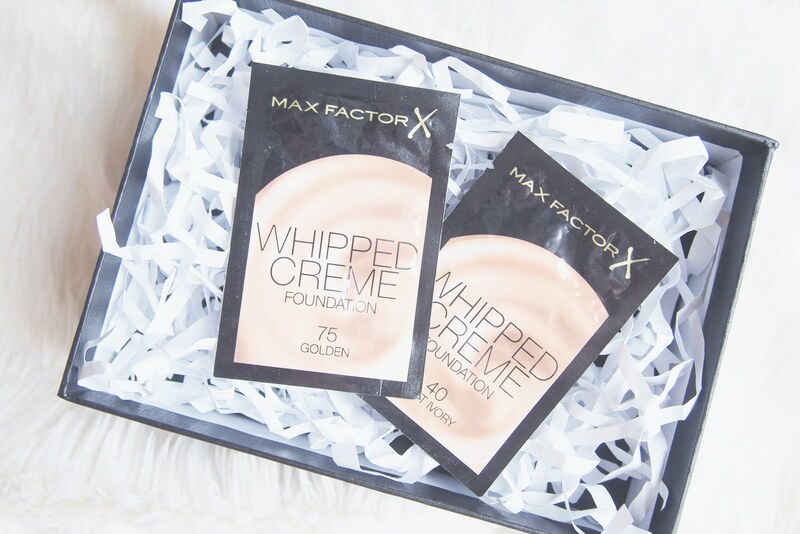 Max Factor Whipped Creme is a foundation whipped, non-oily formula that glides over the skin, to create a flawless demi-matte finish. Unlike some mousse foundations this is claimed not to cake and flake on drier areas. It is perfect for creating a demi-matte look, hydrated with glycerine and water so it glides over skin, won’t clog pores and is oil-free and fragrance-free. Suitable for sensitive skin. Tried this on top of my Naturactor Cover Face and on it's own. First, with Naturactor.. it seemed to give a little more flawless finish but since I was already using a great foundation underneath I didn't really see how great it is with coverage. The following day I used it on it's own, I have to say it covered my redness and it's coverage is pretty much an ace. At first, I thought it's not remarkable in concealing my pimple that had popped above my brows, but after it had set on my face, it was fairly concealed and less noticeable. 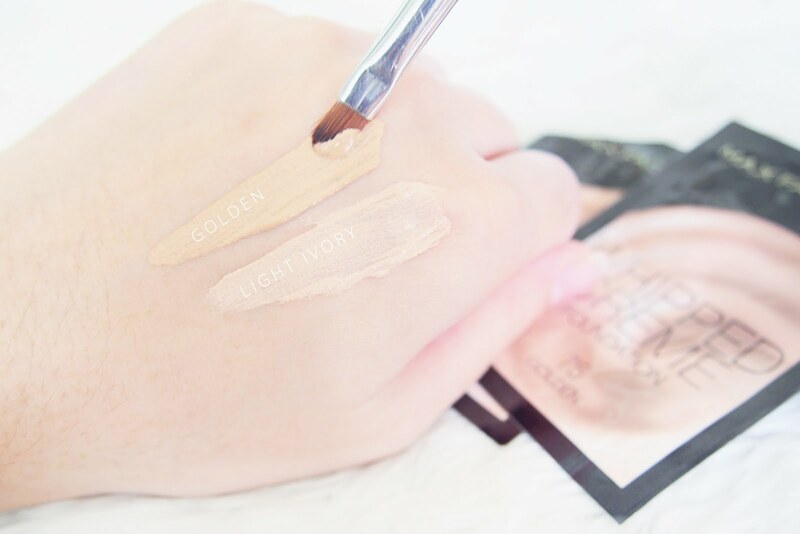 Light Ivory has a more pinkish tone than the Golden which had bit more yellow undertone but once spread on the skin it would also turn out to have a bit of a pinkish undertone too. I used the light ivory all over my face since it's closer to my skin tone then applied the Golden one to my jaw line and temples, just to look a bit three dimensional. The only cons about the product is it's smell! I hate it, huhu. It kinda smells like cream cheese. The scent lost me. It would have been a great foundation since I didn't end up as oily as I normally would. Overall, Etude House Fresh Cherry Lip Tint is my top choice of all the samples and the product I would most likely purchase. It was still fun and great to try and test the other samples. After doing this product sample blog post, I realized that samples are actually better for blogging sometimes. You don't have to worry if the product would work or if you'll be wasting the product itself or money you've spent for one whole container. And that is all! Hope to see you on my next post.